I always have loved Minneapolis, which is why, after only a couple short years of living in Downtown St. Paul, I returned to the other side of the river. I especially love South Minneapolis, which has a warm spot in my heart from my having lived in the teeniest, tiniest of Uptown apartments in those years, just postcollege, when 450 square feet was “the perfect size.” As long as I could walk to a few great happy hour specials, I didn’t even need to bother grocery shopping. My needs and tastes have changed over the years, as most people’s do—well, perhaps not everyone I know, but we’ll say most. I still love a good happy hour special, though, which is what brought me to View the first time last summer. It used to be Dixie’s Calhoun, housed in the lower level of the Calhoun Beach Club, but the place truly has been transformed. View is now a sleek, swanky, sophisticated space, with happy hour specials 3-6:30 PM daily, including $3 tap beers, wine by the glass, cocktails, and some $3 appetizers. It all happens again for the late-night happy hour. Who wouldn’t love that? So, when some friends said they had another friend in town from Chicago, View is where we ended up. We sat on the front patio, with a view of the hustle and bustle of Lake Calhoun, enjoying all things summer in Minneapolis over drinks and good food. I must admit, though, that I never stepped foot inside. I since have been back to dine indoors. I’m thoroughly impressed with the transformation of both decor and menu. The inspiration for Gentile’s menu came from a conversation with his doctor a few years ago, advising him that he needed to lose some weight. View’s chef created items based on appropriate portion sizes, along with some minor adjustments to sauces—plus a section aptly called “Joe’s Corner,” where even healthier options abound. Now, don’t get the wrong idea. View is not a restaurant based entirely on healthy food. Burgers, crab cakes, and even a bacon-wrapped filet are available. Believe me, you’re not going to feel cheated as far as having choices that are hearty, decadent, and lovely. Speaking of lovely: the prices. When I walked in, and saw the elegant surroundings, I expected $15 appetizers, and matching prices for wines by the glass. But I was pleasantly surprised to find an easy-to-navigate wine list averaging around $8 a glass, and modestly priced food. I was slightly startled to see a version of a Caprese Salad ($9.95) offered in January, but I must admit, it is first-rate in both taste and presentation. 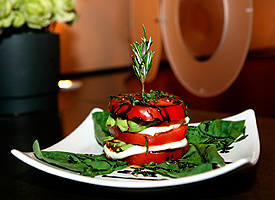 High layers of tomato, avocado, and mozzarella made in-house, drizzled in an infused olive oil and balsamic, are plated on sizable basil leaves. The result is a tower of mouthwatering magnificence. 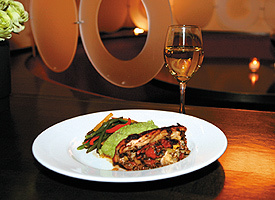 An entrée of Marsala Chicken Breast ($15.95) abounds with rich flavors of sundried tomatoes, mozzarella, artichoke hearts, and portabella mushrooms, all tucked inside. I would rather they be served with a buttery mashed potato, however, than the wasabi ones offered on the side. I found the wasabi, although lightly used, somewhat distracting and unnecessary. 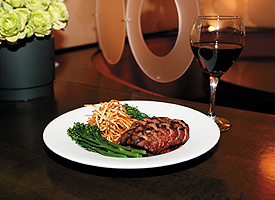 The Flat-Iron Steak ($19.95) was decent. I was happy to see the meat cooked to a perfect pink medium, but found it slightly tough. Gentile pointed out that no sauce is used on the actual meat, but rather on the tarragon mushrooms on which the steak rests. I found myself wanting more of the flavor found in the mushrooms, which was toothsome and pleasing. The pommes frites on the side are a perfect accompaniment, and somewhat addicting. Gentile shared with me a story about a couple who have been frequenting View for quite a while, but never made it to the dessert menu. They recently tried the cheesecake, and were disappointed they hadn’t done so sooner. Don’t make the same mistake, because I am here to report that Gentile’s strawberry cheesecake is pure bliss. Perfectly light, verging on too sweet, but not quite, it is just heavenly. I am telling you, do not miss that dessert menu. I will not guarantee that it’s the healthiest choice on the menu at View, but, hey, it includes a strawberry or two. 2730 W. Lake St., Mpls.